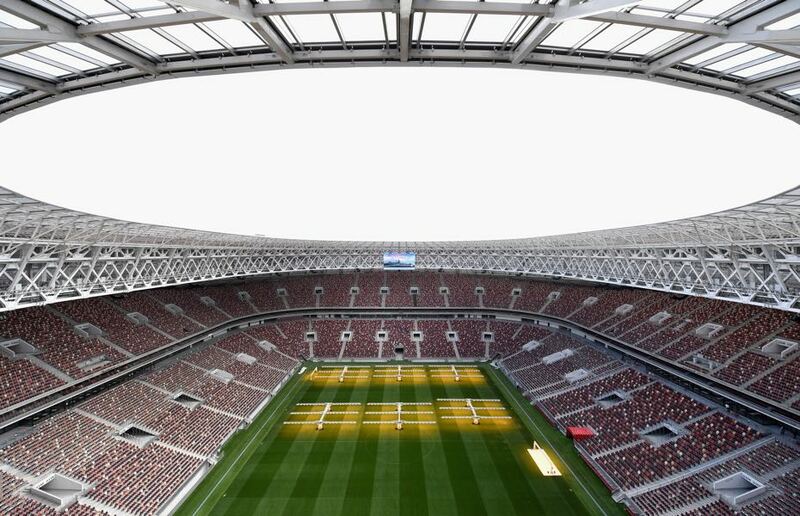 The World Cup will kick off in honest on Thursday at Moscow’s newly renovated Luzhniki Stadium. It will be the first true test for the Sbornaya as they will face the Green Falcons from Saudi Arabia. Coached by Stanislav Cherchesov, Russia had a horrid time preparing for the tournament. Winless in four friendlies ahead of the tournament (D1 L3) Russia failed to secure wins against Austria (0-1) and Turkey (1-1). Friendlies, however, are seldom a sign of true strength, at the same time the Sbornayahave struggled now for quite some time and failed to get out of the group stage at the 2016 European Championships and the 2017 FIFA Confederations Cup. At the Confederations Cup last summer Russia, like it is the case this summer, faced the weakest opponent to kick off the tournament in New Zealand. 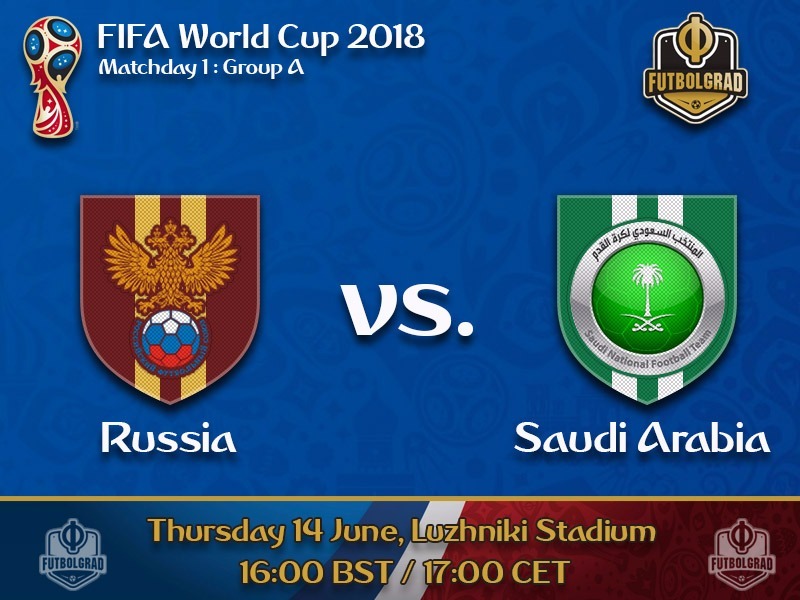 Like it was the case last summer Russia will have to get all three points against Saudi Arabia to have a fighting chance in Group A that also includes Uruguay and Egypt. Saudi Arabia ranked three places ahead of Russia in the FIFA World Ranking, however, will not be an easy opponent for a side lacking confidence at the moment. The Green Falcons, in the meantime, will take confidence from their last friendly against Germany where despite going down by two goals early they managed to get back into the game and almost managed to get a 2-2 draw in the dying moments of the game. Sitting deep the Green Falcons managed to break forward quickly when winning the ball. Germany’s defenders, Mats Hummels and Jérôme Boateng, were able to contain the fast majority of those quick counter-attacks. Russia’s defence, however, is much slower and the likes of Sergei Ignashevich could struggle with the speed of Saudi Arabia’s attack. Regardless, Russia will be the favourites going into the match irrespective as the Luzhniki Stadium will be a cauldron backing their Sbornaya. Key for Russia will be to contain the pressure of having to win the match; the quality should be there to get the job done the question will be whether the Russian players have the nerves to step up to the occasion. Fedor Smolov is the biggest star in this Russia side and will lead the side up front. The striker has scored 12 goals in 32 games for the Sbornaya, and one of those goals was the winner against New Zealand in the first match of the 2017 FIFA Confederations Cup last summer. 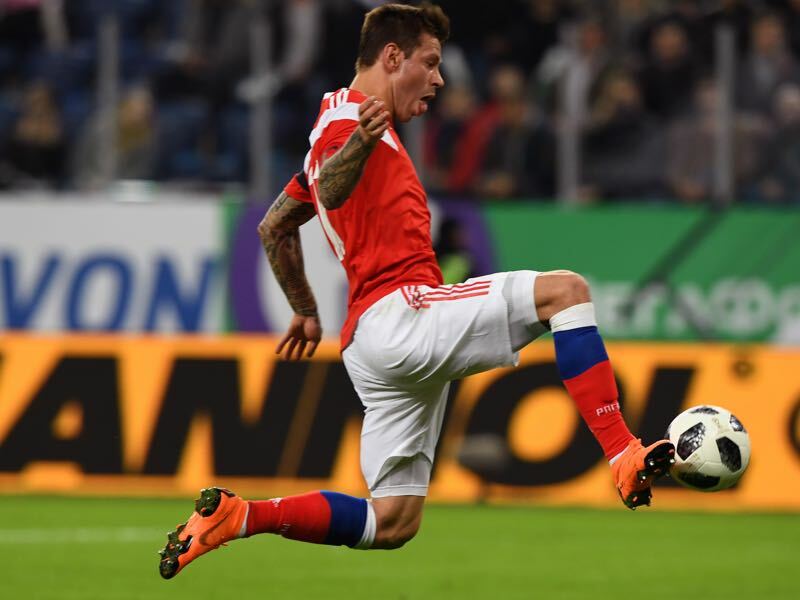 That game, in particular, highlighted that Smolov could get the job done, even when under pressure, and fans of the Sbornaya will once again look at the Krasnodar striker when it comes to clutch moments in Russia’s crucial first World Cup match against Saudi Arabia. Mohammad Al-Sahlawi has one thing in common with Robert Lewandowski. Both managed to score 16 goals in World Cup qualifying. Eight of those goals, however, were scored against East Timor – theGreen Falcons scored 17 goals (7-0 and 10-0) in the two matches against the East Asian side. There is no doubt that Al-Sahlawi is Saudi Arabia’s best striker, but can he translate his game to facing bigger opponents like Germany? Against other top sides from Asia Al-Sahlawi has struggled only scoring once – in a 3-2 defeat to Australia. In recent friendlies against Moldova, Ukraine, Belgium, Algeria, Greece, Peru and Germany – Al-Sahlawi was left without a goal. Saudi Arabia will be the first team from the Asian Football Confederation to play the opening match at a FIFA World Cup. Ranked 70th in the FIFA World Rankings Russia are the lowest ranked team at the FIFA World Cup. Saudi Arabia are ranked three spots ahead of them in 67thspot as the second lowest ranked team at the World Cup. Russia and Saudi Arabia have faced each other only once in history. The Green Falcons beat the Sbornaya 4-2 at a friendly in 1993. Russia are still without a win (D1 L3) in four games in 2018. Croatia World Cup squad analysis – Can Dalić unify the Vatreni?